Heart of the Story: Anything Mary said to influence others that her pregnancy was a supernatural event or that her son was the promised Messiah was met with an eye roll and the equivalent of “Yeah, right.” Eventually, Mary quit trying to explain herself. Back Story: By this time, Mary and Joseph had additional children. Mary could no longer think only of herself and Jesus. Claiming an immaculate conception was just too unbelievable for the townspeople of Nazareth. If Mary continued to deny that Joseph was the father of Jesus, she would keep her sin before the family and village. Mary and Joseph’s other children could be harmed by her insistence that Joseph wasn’t the father of Jesus. 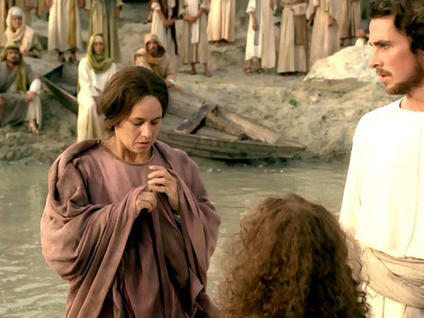 Mary’s stubborn assertion could compromise her daughters’ abilities to make good marriages. Mary needed to live the life God gave her as the wife of Joseph in a small village. For approximately 18 years the Bible is silent on Mary’s life. Then, we see her at a wedding in Cana of Galilee. Joseph wasn’t with Mary, likely he died sometime in the preceding years. Jesus was at the wedding. On the third day of the wedding festival, the host ran out of wine. Mary approached Jesus and told him the problem. Jesus asked Mary why she was trying to involve him; it wasn’t yet time for him to start his miracles. Mary didn’t answer Jesus directly; but, she instructed the servants to do whatever Jesus told them to do. Story Line: Jesus began his public ministry at about thirty years-of-age. Before that he lived in Mary’s home with her and his brothers and sisters. One day after starting his public ministry, Jesus was sitting inside a house. He was told that his mother and brothers were outside and wanted to see him (Luke 8:19-21). Jesus responded that those who believed were his mother and brothers. Jesus said that a prophet was without honor among his relatives and home (Mark 6:1-4). As far as we know, Jesus didn’t go outside the house to talk with his mother. Jesus’ seemingly callous words and actions toward Mary strongly suggested that Mary ceased to believe or ceased to explain that Jesus was the Son of God. How could Mary stop believing that Jesus was the Messiah? Perhaps the reason was tied to Mary’s attempt to rebuild her reputation. Individuals can only rebuild a reputation if they admitted they were wrong and changed their behavior.1 Did Mary say that she was wrong, that she lied, that God didn’t come upon her and cause her pregnancy with Jesus? Did she reject Jesus as the son of God and claim him as Joseph’s son? By this time Jesus was over thirty years-of-age. Joseph was dead. No living person in Nazareth was likely to dispute that Jesus was Joseph’s son. Down Stream: Later, Mary followed and supported Jesus in his ministry in Galilee, Perea, and Judea. Mary was among the women at the crucifixion. From the cross, Jesus addressed her as “Dear Woman” and commended her into the care of John, the apostle (John 19:25-27). From that time onward, John rather than Mary’s sons, took Mary into his home and cared for her. Jesus assigning John to care for Mary may have been because both Mary and John believed that Jesus was God’s son. His brothers and sisters didn’t yet believe Jesus was the Messiah. Mary didn’t go to the tomb on Sunday (Easter) morning to anoint Jesus’ body. Mary knew that Jesus wasn’t really dead. Her son, the son of God, wasn’t in that physical dead body, so there wasn’t any need to anoint the body. The Bible provided no record of Mary meeting with Jesus after his resurrection; however, can you imagine Jesus not appearing to this woman who carried him in her womb and reared him? I am convinced that Jesus sought out Mary and assured her of his continued love. Perhaps, Jesus told Mary that the Holy Spirit would again come upon her; and, this time the Spirit would never leave. After Jesus ascended into heaven, Mary, the apostles, and Jesus’ brothers had central roles in the new Christian church. Mary influenced apostles, Jesus’ siblings, new believers, and unbelievers by declaring Jesus’ supernatural conception. Her statements were strong because she believed them totally. She couldn’t be shaken from her witness. The Bible didn’t record when Mary died or where she was buried. Perhaps as early as the first century, leaders of the new Church knew that establishing the site of Mary’s burial would cause followers of Jesus to worship Mary. Mary shouldn’t nor couldn’t be worshiped. This entry was posted in Husband & Wives, Jesus, Mothers & Sons and tagged Jesus, Lesser Known Bible Characters, Mary, Nazareth, Obscure Characters. Bookmark the permalink.